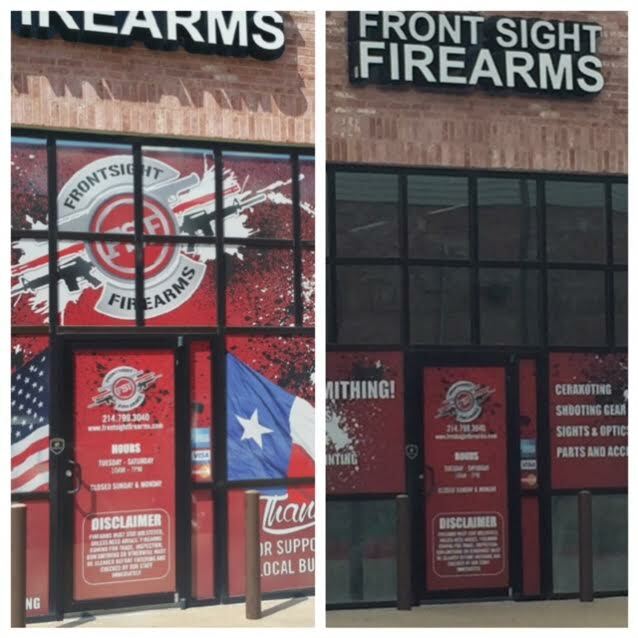 In the wake of the horrific July 7 police massacre and smack dab in the middle of our open-carry state desperately fighting off attacks of the 2nd Amendment, you'd think that Lone Star trifecta would receive patriotic support, punctuated with a red-white-and-blue salute. You'd be wrong faster than a New York minute. Because someone far from here - in geography and apparently ideology - is indeed daring to Mess With Texas. "We're just a couple of friends trying to sell guns the right way," says Russel May, a veteran Sergeant in a DFW department who owns Front Sight Firearms with brother-in-blue partner Eric Wilson. "But these folks in New York are doing everything possible to kill our business. What's happening to us just isn't right." If you've kept up with my writing and ramblings through the years, you know I'm not exactly a gun advocate. But, in trumping that liberal leaning, I am a champion for what's fair. Right over wrong, regardless of the currency in play. And in the case of the policemen's gun store vs. their New York landlord, something seems fishy at best and down right discriminatory at worst. Frustrated by years of being subjected to a double-standard by Rochester-run First Allied Corporation, Front Sight is engaging in a dispute that's trending toward a lawsuit. "In hindsight it's clear they (the landlord) don't like guns," May says. "They didn't really want us there in the first place. But they sure wanted our money. Soon as we signed the lease we've been treated disproportionate and unfairly." By all accounts, they're good ol' boys with great intentions. May, a 48-year-old Sherman native, moved to McKinney 14 years ago after serving in the Grayson County Sheriff's Office; Wilson is a local law-enforcement officer whose current responsibilities require a lower profile. Their friendship included a shared love of firearms, and a business relationship blossomed. With Federal Firearms Licenses and all the secondary job paperwork filed with their appropriate law enforcement departments, Wilson and May began selling guns part-time out of their houses in the mid-2000s. "We knew we were on to something," May says. "Outgrew our garages in no time." 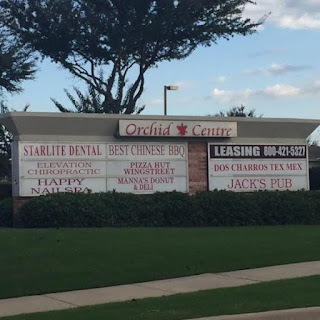 In the Fall of 2013 their search for a brick-and-mortar space led them to Orchid Centre, a shopping center managed by First Allied and located on Eldorado Parkway in the northern Dallas suburb of McKinney. Far from perfect, the modest spot was next door to a karate studio and sat - blocked from the main street's view - directly behind a free-standing building anchored by a UPS store. And the monthly rent of $2,759 uncomfortably bulged their budget. At that price and with that obstructed view, no wonder the space sat vacant for four years. May and Wilson had the lease looked over by a realtor friend, who found nothing out of the ordinary in what he termed a "standard lease." 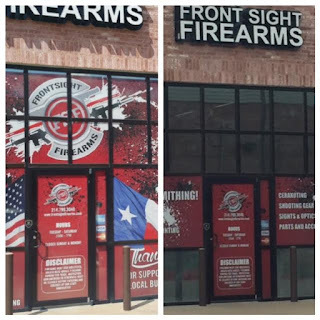 On Oct. 10, 2013, with relatively minimal haggling, Front Sight had its location, McKinney had its first and only Class 3 firearms storefront and First Allied finally had a tenant. "At first, they wouldn't let us put in bollards to fortify the front entrance, but we did get them to eventually agree to those and to let us put in a steel hurricane door," according to May. "We wouldn't move in without it being safe. I wouldn't have been able to rest my head on my pillow without proper safety measures. (Upgrading the security) was a deal-breaker to us. Trust me, no one is more concerned about keeping guns away from the bad guys. That kind of goes without saying. Plus, we promised to take everything out when we moved out. No big deal." But May and Wilson, turns out, were just beginning a litany of headaches. About nine months after they opened for business in December 2013, a space became available next to UPS in the free-standing building close to Eldorado. Being a tenant with a long lease, high hopes and a perfect rent payment history, May inquired about moving into the much more visible space. Without any explanation, their request to relocate was denied. Inexplicably, he got the same answer 90 days later when the karate studio next to Front Sight up and moved out. That simple move next door would've doubled Front Sight's square footage and increased its visibility as a corner store. After being told to stay put, the adjacent space sat vacant for almost a year until Condom Sense moved in. "With us," says May, "it's been ugly from the get-go." First Allied was founded in 1984 in Los Angeles by the late Malcolm Glazer, whom Forbes regularly ranked among the planet's 400 wealthiest humans. His real estate holding company, which also has management offices in New York, today owns and operates almost 7 million square feet of shopping centers across 20 states. When Glazer died in 2014, his family - including six children - was left to run his business empire including the NFL's Tampa Bay Buccaneers and English Premier League soccer giant Manchester United. Talk about being born deep in life's Red Zone, sons Joel, Bryan and Edward were handed down First Allied. May says he has never spoken to a Glazer, instead left to communicate with First Allied's Rochester-based Operations Manager, Greg Burnham. He's treated Front Sight as a nuisance, like Hillary and those pesky emails or Trump and the raunchy remnants of a hot mic. Reached on the phone Monday morning with a repeated offer to tell his company's side of the story, he was as dismissive as advertised. "We don't comment on anything in regard to relations with our tenants." Strangely, interviews with several Orchid Centre tenants revealed little or no other landlord problems. "It's good," characterized one owner who has conducted business in the shopping center for four years but wished to remain anonymous. "The place always looks good. Gets kept up nice. I haven't had many problems, but when I have they've addressed them pretty quick." With First Allied tight-lipped, we can only speculate at the reason for the uniquely strained relationship with Front Sight. New York, blue-state liberalism? Anti-guns? Anti-cops? Culture conundrum? Whichever, even before being roadblocked in their desire to change spaces Front Sight was handicapped from the start with an identity crisis. A couple weeks after moving in May and Wilson realized their Front Sight name did not - as expected - get placed alongside the other stores on Orchid Centre's monument sign at the high-traffic intersection of Eldorado-Orchid. Soon after, however, a First Allied "Now Leasing" slide-in sign on the monument vanished, leaving Front Sight to consider it an invitation. "Two weeks later we got a letter telling us to take it down or we'd be in default of our lease," says May. "So they needed a spot on their monument sign and a big, separate, double-sided sign for their company? But none for their new tenant? Sorry, but that's screwed up. So much for welcome to the neighborhood." May says he asked Burnham where they could put a sign and was told "You don't have a space." "Not only that, he accused me of stealing his sign," May says. "I told him, 'I'm a policeman. I've got a lot better things to do that go around stealing your $3 signs'. It's not like we're trying to move mountains or ask for a special favor. Just let us advertise our store. I mean, plain common sense says you have to have signage, to advertise in order to sell things. Letting people know we were there was a huge challenge from almost day one." May: "I don't understand why you don't want your tenants to be happy? Don't you see that if we make more money, you'll make more money?" Burnham: "I'm not concerned with your success. I've already got your signature on a 60-month lease." "That," says May, "is when we really realized what we were up against." With customers slow to trickle in to the almost invisible location, Front Sight was forced to become innovative. They constructed a wooden sign, and put it in the back of Wilson's parked pickup adjacent to Eldorado. Immediately, business boomed. Recalls May, "Yeah, we did okay. For about three months." Short-circuiting Front Sight's blip of prosperity, another letter arrived from First Allied's Burnham warning to move the truck ... or else. Same with a sandwich board sign out on the sidewalk, placed alongside the exact same type of sign that other tenants such as Pizza Hut were using. 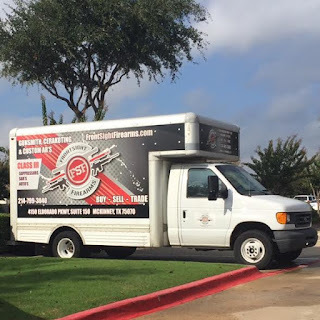 And same for a box truck the partners bought, wrapped in advertising and parked by the street. With each new attempt to attract customers, Front Sight was greeted with a "default on your lease" threat from the folks in New York who obviously failed Southern Hospitality 101. The box truck actually stayed - and worked - for 10 months. Until one morning when it didn't. Because it was, well, gone. "First Allied towed it," May says. "Even though I reminded Mr. Burnham that I know the city ordinances here better than him, and that there weren't any towing signs anywhere in that parking lot. I told him I wanted our truck back, but he just stumbled and mumbled and ... it's probably still sitting wherever they towed it." Undaunted, Front Sight resorted to Plan - oh, I've already lost count - and bought another box truck. But this time each night they moved it from the street to the back of their store in their designated parking spot. It didn't work. A towing company arrived one day, but May sternly warned the driver that there were no signs in the parking lot. The tow truck left, but it was merely a temporary stay of execution. A week later - now in early 2016 - May and Wilson arrived at the store only to find new "Towing Enforced" signs in the front, and nary a truck in the back. "We checked our security cams and, sure enough, First Allied hired a different towing company and they came at 2 in the morning so nobody was here to stop them," says May. "The transmission was ruined, the tires locked up and there were skid marks all around the back of our space." But when May says he demanded $2,000 for repairs on the towed truck, he was again met with indifference. Somehow still undeterred, last June Front Sight adorned its front windows with garish red, white and blue signage that included American and Texas flags that goosed business, before, of course, First Allied sent yet another demand letter to remove the flags. I mean, really, the most dickish of HOA's wouldn't even do that. An understated, flagless strip of that display remains, only because May reminded Burnham that Pizza Hut is allowed to have the exact same type of signage in its window. From JFK to J.R. Ewing, guns are an ingrained, important fixture in Dallas' culture and Texas' history. What First Allied is doing is akin to holding a ribbon-cutting ceremony for a new Philadelphia restaurant, then promptly cutting off its supply of cheesesteak. At its peak doing six figures in revenue, Front Sight - mainly due to sketchy signage - has seen that number drastically evaporate. "We did half that in August. September was bad. And October looks worse," May says. "In this area, with what's going on around the world, and with what we provide, our business should be off the charts. But we're being choked and bled to death by our own landlord. If we try anything to spark business we get a letter threatening to 'comply' within 10 days or else we'll be accelerated into default and be facing $80,000 in legal fees just fight it. We know we're right, but we can't afford that. We're cops, for crying out loud." These days Front Sight parks the box truck - repaired out of their own pocket - by Eldorado a couple days a week. They have negotiated a deal with a neighboring store to park the truck inside a locked garage every night. In the meantime, May and Wilson are searching for a new home. With 24 months left on their lease, they can't yet afford to just pack up and leave. But can they really afford to stay? They plan to reach out to the National Rifle Association for help. Maybe a boycott of Orchid Centre will rattle First Allied's New York cages, just enough for the company to tear up the lease and allow Front Sight to skeedaddle. "At this point we just want to move," May says. "We're in Texas and we're legally, safely selling guns. There just has to be a friendlier place." It's a shame those harmonious, home elements are being forced to play an unfair road game. Yep. At a time when cops are under more duress than ever it just feels unfair. And not accidental. While the property owners are, obviously, dicks...I just can't support another gun store. Who signs a 60 month lease for a small business, anyway? A 5 year lease is a pretty standard practice for the North Texas area! The rental of this property has several advantages. However, we can point out some disadvantages of such investments. It is necessary to consider carefully before taking such a step. Is it true? I never had known this, if you wouldn't have informed Anyways, for the people in Canada, vancouver towing service is the best for towing truck service. thanks for describing this event in details! I think it can lead to serious consequences of the world scale! Thanks for this wonderful description. Actually, I prefer the towing company vancouver service most because it's the most convenient one for me and it is really very committed to its customers.